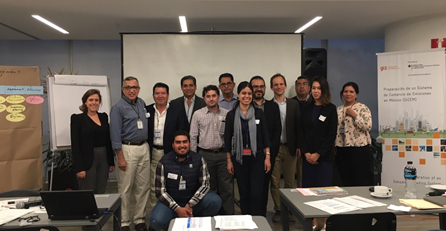 The objective of the workshops was to bring together representatives of the steel and cement sectors to present and discuss the typical tasks and responsibilities that a company assumes under an Emissions Trading System (ETS). The process of designing the ETS for Mexico has brought several opportunities for capacity development. The subjects taught during the trainings in 2018 have evolved as the design process has progressed. 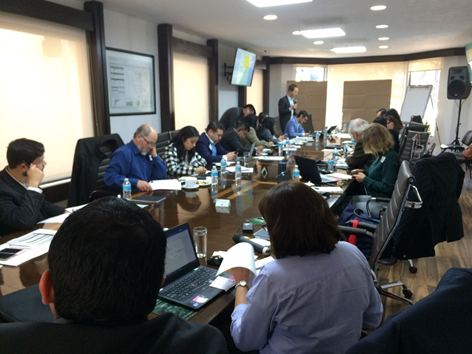 The training sessions have been focused on industry sectors whose historical emissions of greenhouse gases (GHGs) make them relevant for the design and implementation of the ETS in Mexico. The preliminary bases constituting the legal framework of Mexico’s ETS were developed by the Working Group of the Ministry of the Environment and Natural Resources (SEMARNAT) in collaboration with the private sector. The bases are now ready and additional information sessions will be held to better publicize their content and objectives, as well as those of the ETS pilot program established by Article 94 of the General Law on Climate Change. In this context, it is a priority to strengthen the capacities of relevant sector representatives regarding their knowledge of the ETS compliance cycle. Accordingly, the workshop covered topics related to the monitoring, reporting and verification (MRV) of emissions, as well as the delivery of emission allowances corresponding to the previous compliance period. Along these lines, the workshops addressed issues concerning decisions about reducing emissions within companies or buying emission allowances in the market to ensure compliance. Finally, the workshops covered other topics of interest, such as competitiveness and allowance allocation. The sectoral workshops, starting with the steel and cement sectors, aimed to provide training designed for the particular needs of the sectors. Using interactive elements, the workshops provided specific examples and best practices for each sector so that they could answer the following questions: How should compliance be managed? What internal processes should be established? What aspects needs to be considered at the time of decision making? In this workshop, a summary was given about “The State-of-the-Art Clean Technologies (SOACT) for Steelmaking Handbook,” a report that discusses the options for saving energy and reducing environmental impacts in the steel sector. Participants brought up several concerns during the workshop, including how to deal with the shortage of natural gas used in electric arc furnaces, and how to remain competitive at the business level. The workshop was held at the offices of National Chamber of the Iron and Steel Industry (CANACERO), which also helped organize the event. The workshop included the presentation “CO2 Mitigation Strategies in the Cement Sector” by the engineer Enrique de Hoyos of CEMEX. One of the main concerns expressed during the workshop was how to deal with the high initial investment required to lower emissions in the cement sector, since the projects are large and take time to recover their investments. Other questions focused on the amount of allowances that should be allocated. The workshop was organized in collaboration with the National Chamber of Cement (CANACEM) and carried out in the offices of SEMARNAT. The workshops were held on December 4 for the steel sector and December 5 for the cement sector, with 30 total participants. The sectoral workshops were carried out within the framework of the Preparation of an Emissions Trading System in Mexico (SiCEM) project developed by the Deutsche Gesellschaft für Internationale Zusammenarbeit (GIZ) GmbH and commissioned by Germany’s Federal Ministry for the Environment, Nature Conservation and Nuclear Safety (BMU) in support of SEMARNAT.